This Baby Ripped Immigration Law "To Pieces"
What was your immigrant ancestor's greatest fear? One of them very well could have been getting detained on Ellis Island. So close to, yet so far from life in the United States, this fate befell a surprising number of our ancestors. Many spent weeks traveling thousands of miles, only to be quarantined or sent back home just as the newly built Statue of Liberty came into view. People could be barred entry for various reasons, such as poor health, but others were simply unlucky in that the number of immigrants being accepted from their country had already been reached. Those who were held were reportedly kept in cage-like rooms containing two tiered bunks, often locked in, to prevent thievery. Imagine an immigrant mother and father, who had their newborn baby ripped from their arms because of a technicality in U.S. immigration policy. 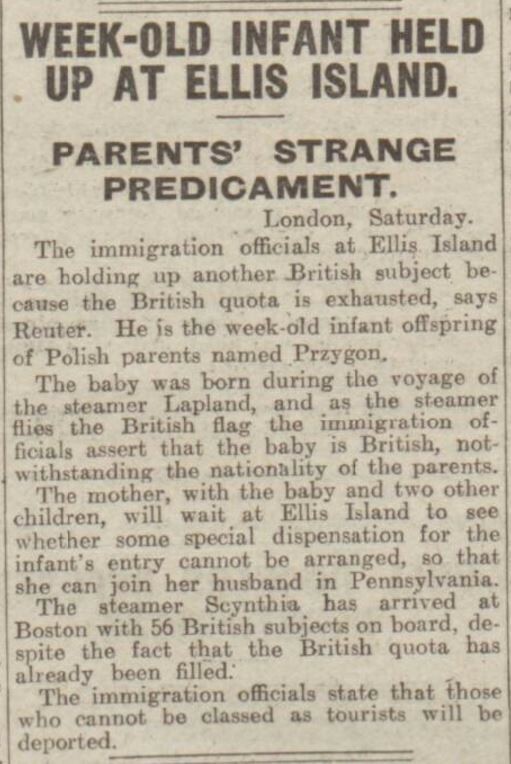 This nightmare became a reality for the Przygon family, who were all cleared for entry into the United States, except for the newest member of their family, Sofia, who had been born on board the Lapland only the week before. 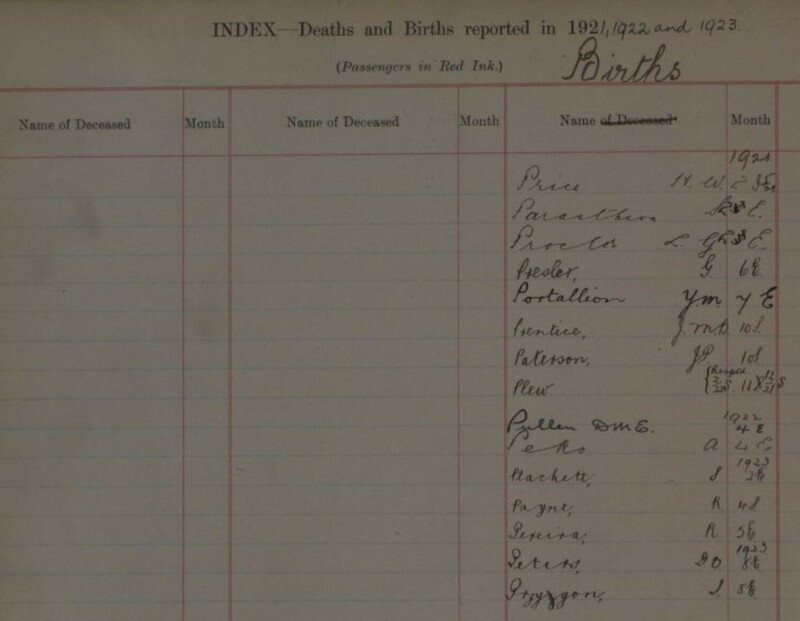 Because the steamer they arrived on carried the British flag, immigration officials declared the child to be a British national, as seen in our British Nationals Born Overseas 1818-2005 records, despite the fact her parents were both Polish. 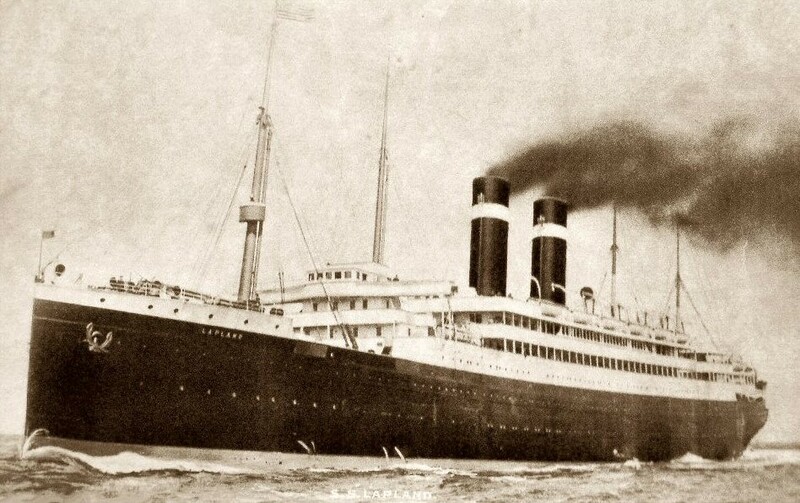 The U.S. had already taken the maximum number of British immigrants they could accept (quotas and limits became policy late in the 19th century), and so Sofia's mother stayed on Ellis Island with her and her two other children, waiting to hear if she could join her husband in Pennsylvania. What happened to poor Sofia and her family? How long was she detained? Did she ever make it in to America? We discovered the answer in a July 27th issue of the Goodland Herald in our U.S. newspapers collection. 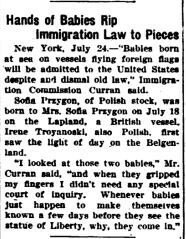 "Babies born at sea on vessels flying foreign flags will be admitted to the United States despite a dismal old law," Immigration Commisioner Curran said. Sofia Przygon, of Polish stock, was born to Mrs. Sofia Przygon on July 18 on the Lapland, a British vessel. Irene Troyanoski, also Polish, first saw light of day on the Belgenland. "I looked at those two babies," Mr. Curran Said, "and when they gripped my fingers I didn't need any special court of inquiry. Whenever babies just happen to make themselves known a few days before they see the statue of Liberty, why, they come in." We're so glad Mr. Curran made a swift and sensible decision, and we must congratulate Sofia on her success taking down such a dismal old law!